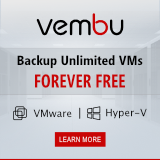 In the past VMware bought a product that could manage your user environment. When I say manage I mean it synchronized a Windows profile to a central location and after that only loaded the files and registry settings needed at that time. When an application needed some files Persona Management (that’s what the product is called) loaded it on the fly. The product did what it did: profile synchronization. 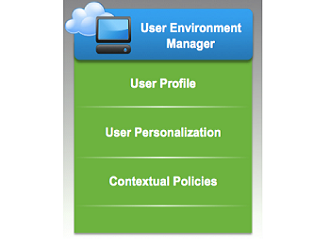 But it wasn’t a real User Environment Manager (UEM). With the acquisition of Immidio VMware finally has a real UEM. 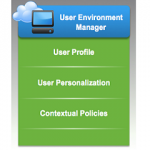 User Environment Manager is a powerful, simple, and scalable user environment management solution that helps IT with profile management and setting up dynamic policies, without the need for special mangement servers or databases. The installation process is simple, can’t say anything else. You download the zipfile, a whopping 25MB in size. After extracting the zipfile you have two installers, one for x86 and one for x64. During the installation you may notice that the install directory is still Immidio\Flex Profiles. This probably will be changed in a next version. As one of the steps in the installation you have to choose your license file. After that click next and install. Voila! It’s installed. Ofcourse you’re not done yet. You still have to configure UEM. For UEM you need two shares, one for the configuration (for example \\fs01\UEMConfig) and one for user profiles (\\fs01\\UEMProfiles). Check the documentation for the exact permissions the users and admin need. The configuration of UEM isn’t stored in a database, as opposed to for example RES Workspace Manager. Instead it stores the configuration in files in a directory structure. By using a directory structure on a file server or CIFS share the solution can size with the size of the file server. If you want a backup? Copy the complete structure and you got a backup. 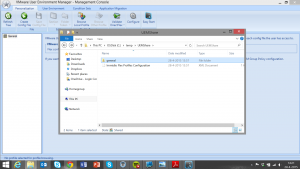 The UEM profile share is used to store the personal settings for all users. A unique subfolder is created for each user. The personal user settings are read from this share at login or at application start, and are written back at application exit or at logout. Users need “change” permissions to store their personal settings in this share. This share contains mostly ZIP files, UEM profile archives. How much storage space you need depends on the number of users, the number of applications, and the number of backups. Easy Start installs a default set of UEM configuration items, so you can quickly can get a feel for the UEM functionality. You can use these items as is, delete some of them, or just use it as a starting point for your own implementation. In addition to the default settings you can select one or more Microsoft Office versions to pre-populate UEM. For UEM to work an agent needs to be installed in your desktop. It’s good practice to add this to your golden image or deployment mechanism. The installation is the same as for the console, with the exception of installing the console itself. ‘But,’ you say, ‘I don’t have a VDI solution right now. I simply want to migrate from Windows 7 to Windows 8.’ Or you have problems with long login times and don’t want to add to them. With UEM you can clean up and manage your profiles, before making the switch to another desktop or OS. The best option I think is to just try it out yourself. Since the installation is so simple you can try it out in a day or so. Go for a trial license to the VMware website.